Depending on why you are coming to Turkey and how long you are staying, you may need a visa and other permits. This article provides an overview of Turkish immigration requirements. No matter where you are from or why you come to Turkey, you will need a valid passport from your country of origin. Your passport should also have at least 90 days validity remaining. Even if your passport is within 6 months of its expiration date, consider renewing it before your trip or move to Turkey. Whether or not you need a Turkish visa will depend on your country of origin and the length of and reasons for your trip. Many countries have signed Visa Exemption Agreements that allow their citizens to visit Turkey for up to 3 months without a visa. Certain nationalities that are not visa exempt may obtain visas at their point of entry into Turkey (though they will be charged a cash fee). For a list of these countries and their permitted lengths of stay, check with the Turkish Ministry of Foreign Affairs . The Ministry also lists fee amounts on its website. 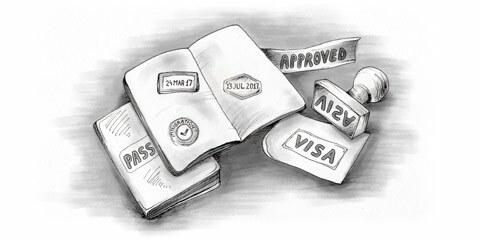 Visa – Apply for a visa at a Turkish embassy or consulate in your home country. Make sure to do this well before you leave for Turkey. It may take Turkish officials several months to process your application. If you have any questions about which visa you will need, ask the embassy officials. Fixing a mistake with Turkish immigration authorities will not be pleasant. Work and Residence Permits – If you will be living in Turkey you need to obtain a residence permit, and if you are working, you will need a residence permit and a work permit. Apply for residence and work permits at the Turkish embassy or consulate in your home country. Additional Information – You will probably have to provide proof that you either have or can purchase a return ticket to your country of origin. Similarly, you may be asked to show proof of a hotel reservation (if your housing has been pre-arranged by an employer, proof of that will suffice). If you plan on leaving Turkey and returning at some point during your stay (for business or vacation), make sure that you apply for a visa that allows multiple re-entries. If you leave the country and are only eligible for a single entry, you will be refused entry upon your return. Again, verify all requirements and restrictions with the Turkish embassy or consulate in your country before you submit your application. Ask questions if you are unsure of anything. The immigration process will probably test your patience from time to time, but it is better to confirm information with Turkish officials than make mistakes on your applications.